Excellent quality printing by Cartograf; six marking options. A great first release from Bingo Decals. 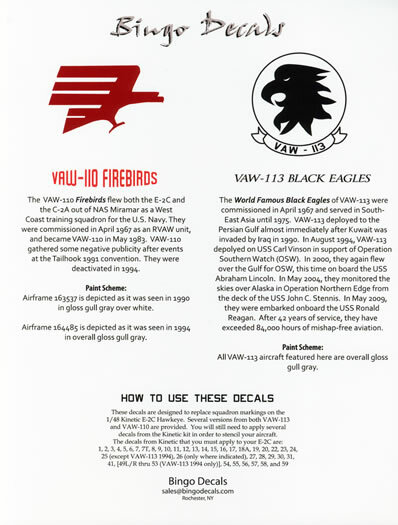 It provides you with first rate decals to enable you to depict your new Kinetic E-2C Hawkeye in other than the kit decals. 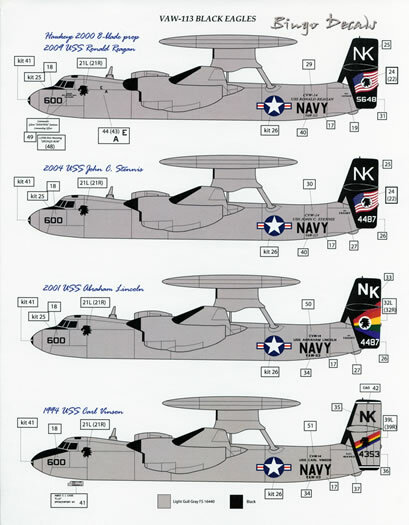 48-002 is the second release in Bingo Decals’ six-sheet coverage of the Grumman E-2 Hawkeye in US Navy service. Whilst their first release was good, it was not without issues with the provided support material. This sheet however has addressed the shortcomings and provides far better information to assist you in modelling each option. 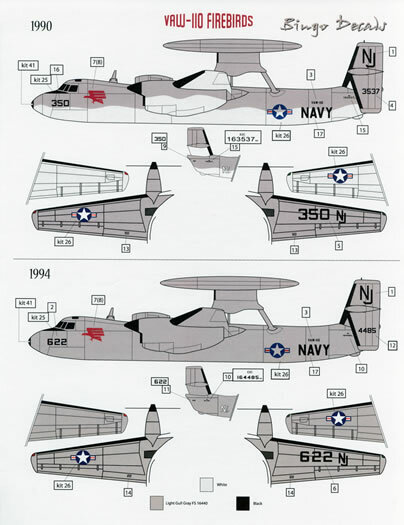 The Pacific Fleet’s VAW-110 Firebirds (a Fleet Replacement Squadron that was disestablished in 1994) and VAW-113 Black Eagles are the focus of the sheet and markings are provided for five different E-2C airframes in six different markings. Modex 350, Bureau number 163537 assigned to VAW-110 in 1990. Modex 622, Bureau number 164485, VAW-110 in 1994. Modex 600 Bureau number 165648, VAW-113, CVW-14 embarked aboard the USS Ronald Reagan in 2009. (Note that this option is a Hawkeye 2000 sporting the new eight-bladed all-composite Hamilton Sundstrand propellers whilst all the other options are fitted with the four-bladed Hamilton Sundstrand 54460-model electro-mechanical, steel-spar propellers – see the note at the foot of the page for your options in 1/48 scale). Modex 600 Bureau number 164487 VAW-113, CVW-14, USS John C. Stennis from 2004. Modex 600 Bureau number 164487 (again), VAW-113, CVW-14, USS Abraham Lincoln from 2001. Modex 600 Bureau number 164353, VAW-113, CVW 14, USS Carl Vinson, in 1994. As mentioned above, Bingo Decals have supplied far better supporting information with this sheet. You are provided with three A-4 sized sheets that show full-colour drawings of each option. These consist of left hand side profiles of each option as well as a pair of generic right hand side profiles for each squadron, upper and lower surfaces of the wings, and oblique views of the horizontal and vertical stabilisers. A single generic plan view of the nose rounds out the illustrations. 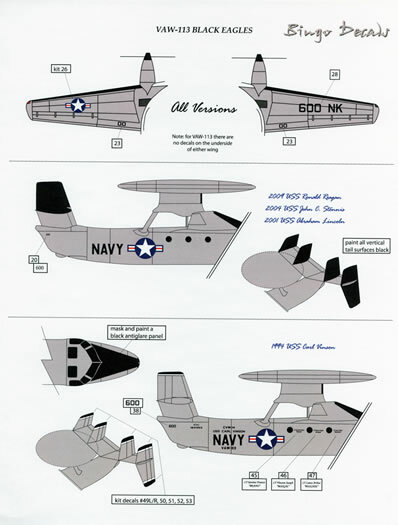 Paint scheme information is provided too listing the first VAW-110 option as being in gloss gull grey over white with all other options in overall gloss gull grey. The decals themselves have been printed by Microscale Industries and as you would expect from this pioneer of the aftermarket decal industry they are absolutely superb. They are thinly printed with an utter minimum of carrier film surrounding each design and are in perfect register. 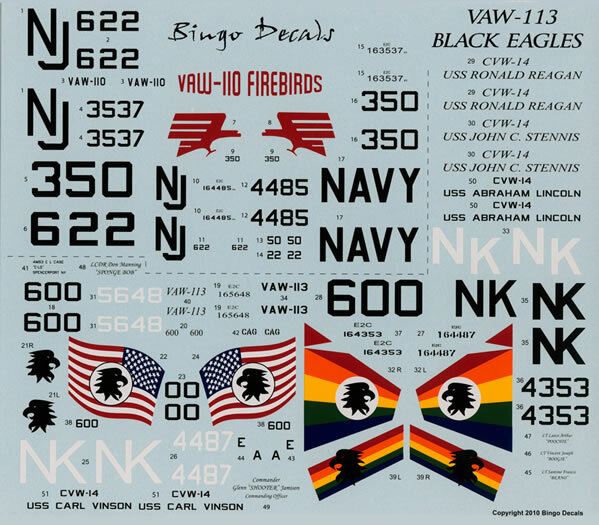 As with their first sheet, you are only given squadron markings and serials as well as various crew names – Bingo Decals advises that the names of the Electronic Warfare Officers are fictitious as they did not have reference to the actual names painted on the one-to-one-scale airframes. The placement guides tell you to apply the Kinetic E-2 kit decals for the rest (the stencil data as well as the national insignia). For those who don’t have the Kinetic kit its decals are very comprehensive indeed as well as being of excellent quality (produced by Cartograf). The three placement guides as well as the decal sheet and a thin cardboard “header card” come packed in the same large 12″ x 9″ (305mm x 230mm) paper envelope with a clear front as their first release. 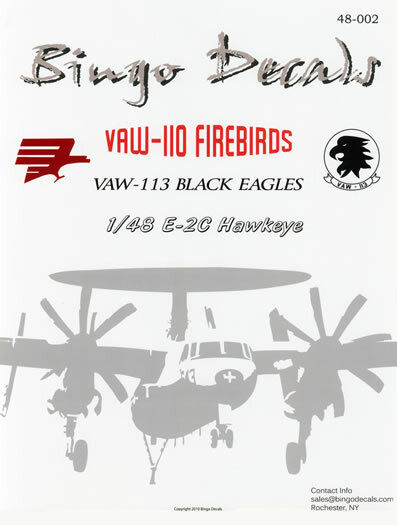 Fans of 1/72 scale will have to look elsewhere as Bingo Decals only produce the sheet in 1/48 scale. This is a great sheet from Bingo Decals. They have listened to the feedback provided by modellers and have improved their supporting material so as to provide you with an even better product. For more information about this set and the other releases from Bingo Decals, visit their website at http://www.shop.bingodecals.com/ . The Kinetic E-2 kit has been re-boxed and released by Italeri. It carries a first rate decal sheet as well as both four and eight bladed propellers. Kinetic have also released an E-2 2000 kit with the eight-bladed propellers. Alternatively, if you have a Kinetic E-2 2000 kit and want to model an earlier four-bladed machine you can purchase resin aftermarket ones from Quick Boost.